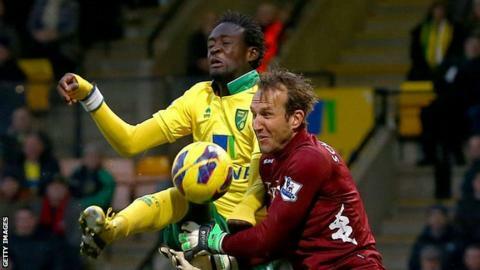 Norwich striker Kei Kamara has said his Premier League debut at the weekend would have created a massive buzz in his home country of Sierra Leone. "They say all the cinemas were full. I don't even know what it would have been like out there," the forward told BBC Radio Norfolk. "There's going to be a bunch of yellow shirts out there with my name on it." Kamara moved to the United States as a refugee aged 16 after two years in Gambia, during a period of civil war in Sierra Leone. He came through the USA college system and earned a draft to MLS side Columbus Crew in 2006, before moving on to San Jose, Houston and then Kansas. The signing of Kamara, who has 14 international caps, was but he did not receive international clearance until last week. "After the move became official, for Norwich's last game against QPR everybody was in the cinemas thinking I was playing," he said after playing the last five minutes against the Cottagers. "It's a good thing my phone doesn't work right now because if it did I would be having so many phone calls. "I represent my country wherever I go but being here now - it's the talk of the town. "If I do well people might recognise where I'm from, maybe they will Google Sierra Leone a little bit more. "When I go to the national team, everybody always asks, 'when are you going to England?' because it's basically the only game that's screened all around the world." "He's in for a short period of time," said Hughton. "The worst thing is, if you put him in too early and he gets an injury, then you end up not having him for a few weeks. "So we took a chance but I liked what I saw."